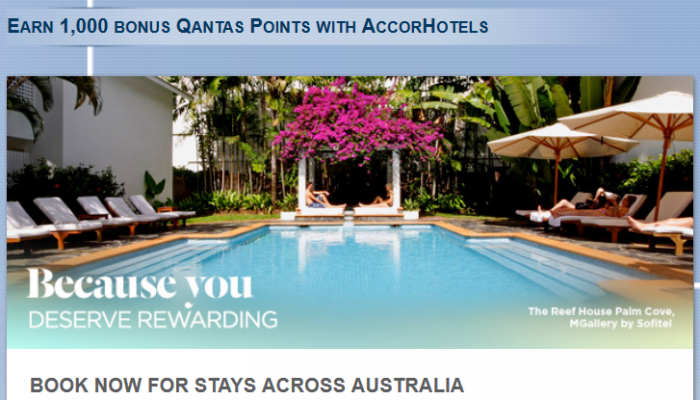 Le Club AccorHotels has launched a bonus miles promotion for Qantas member stays in Australia between July 19 – September 30, 2016 (must book by September 12). The offer is valid for stays of minimum two nights in Australia and by Le Club AccorHotels members with an address in the same country. Note that you can earn the bonus miles unlimited number of times during the offer period. Le Club AccorHotels is very active with number of bonus miles offers for various airline program members. I tend to like the bonus points offers, however. 1. General Le Club AccorHotels terms and conditions apply to the “QFF 1,000 bonus points” offer and you must be a Le Club AccorHotels member to benefit from it. 2. You must be a Qantas Frequent Flyer to earn and redeem Qantas Points. Membership and points are subject to the Qantas Frequent Flyer program Terms and Conditions athttps://www.qantas.com/fflyer/dyn/program/terms. 4. This offer entitles Le Club AccorHotels loyalty members, regardless of their status, to benefit from earning 1,000 bonus points for a stay in one of the participating hotels in the Le Club AccorHotels Loyalty program. This promotion is not applicable for hotel partners of Le Club AccorHotels. 5. In order to benefit from this offer, the member must have activated “Qantas Frequent Flyer” as their preferred automated conversion option ahead of the stay. This option should remain activated until the member receives the points related to his/her stay on his/her Le Club AccorHotels membership account. 6. The stay must be a minimum of two (2) nights. 7. Any consecutive stays (check-out and check-in the same day) in the same hotel, will be considered as a single stay. 8. For the purpose of this offer, a stay is one (1) reservation made by a Le Club AccorHotels loyalty member for one (1) or more rooms. For the avoidance of doubt, a reservation made for more than one (1) room will therefore be considered as only one (1) stay. 9. To benefit from this offer, your booking must be made on Accorhotels.com or our participating brand websites or via AccorHotels call centres. All other reservation channels will not be eligible for this offer. 10. You must provide your Le Club AccorHotels loyalty card number when making your reservation, and present your card at the reception desk of your hotel when you check-in for your stay. 11. Le Club AccorHotels bonus points are credited to the member’s account within 10 days following the end of his/her stay. 12. The bonus is credited in Le Club AccorHotels points within 10 days following the end of his/her stay and converted within 6 weeks into Qantas Points according to applicable conversion rule. 13. This offer cannot be combined with other current promotional offers or advantages and does not apply to groups. 14. If the stay meets the terms and conditions for several offers, only the bonus points linked to the most generous offer (meaning that allows you to earn the highest number of points) will be credited to your account. 15. Any stay partly or entirely paid with Le Club AccorHotels points or with one or more vouchers will not be eligible to receive this offer. Stays entirely or partly paid for with Le Club AccorHotels points, or with one or more vouchers will not count towards offers that require multiple stays for points earn. 16. This offer is subject to availability. General sales terms and conditions apply for reserved public rates specific to each hotel. 17. Please specify the reference ID: 47073 in all your communications with AccorHotels call centres or customers care services related to this offer. 18. The offer is available for multiple stays within the offer duration. 19. This offer is available only to members with an address in Australia. Previous articleIndonesia Receives ICAO Safety Standard Upgrade To Category 1 – Garuda Now Able To Expand With USA Flights!